Eat fat! That is the message delivered in new studies that suggest Americans have wrongfully avoided fat in their diets for decades. In an effort to deal with the growing epidemic of heart disease, scientists turned their focus to cutting fat from diets. Many of those studies failed to control for major heart disease contributors like​ smoking, stress, sedentary lifestyles, and obesity. Nonetheless, the war against fat had begun. Now, as scientists gain a more nuanced understanding of saturated fats and cholesterol, it is becoming clear that fat is not the enemy. In fact, since the beginning of this war on fat, American dietary disease prevalence has increased. The word about fat is getting out. On June 23, Time Magazine’s cover simply read, “Eat Butter”. The cover story, “Ending the War on Fat”, by Bryan Walsh, documents ​the beginnings of the effort to curb fat from the American diet, and how the science has come to realize the fat in meat and dairy are integral parts to a healthy diet. Also in the spotlight is Nina Teicholz’s new book and New York Times Best Seller, The Big Fat Surprise. Teicholz’s book provides an even more in-depth history of the battle against fat and the ways modern science is proving the anti-fat craze to be misguided. Of course, this news comes as no surprise to dairy farmers. Dairy farmers have always known the nutritional value of their milk, even if they didn’t have clinical studies on their side. The message to cut dairy consumption was heard loud and clear; according to the Time Magazine report, fluid milk consumption from decreased nationally by 72 percent between 1977 and 2012. Our dairy farmer members welcome the recent publicity and hope it brings to light the issues facing the dairy industry today. The Farm Bill passed earlier this year contains a new pricing system intended to compensate dairy farmers for the difference between national milk prices and their costs of production. 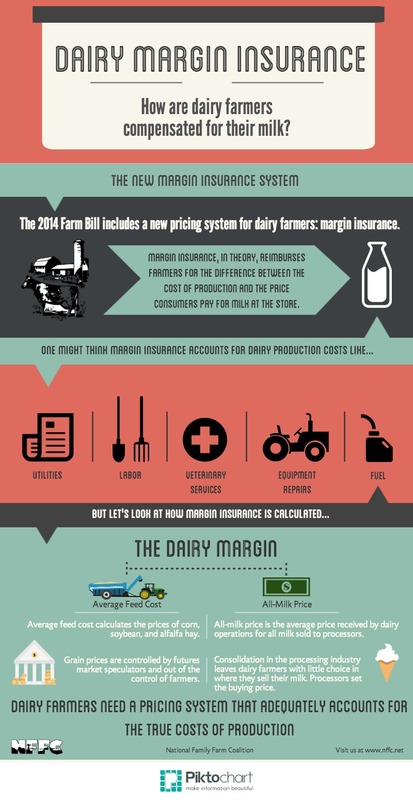 The aptly titled Margin Protection Program, which USDA expects to implement this fall, reimburses farmers for the difference between average feed costs and average national all-milk prices or the price processors pay for milk. With feed costs easily manipulated by futures market speculation and all-milk prices controlled by processors, dairy farmers have absolutely no input into the calculations of their reimbursement. Ongoing free trade negotiations like the Trans-Pacific Partnership (TPP) and the Transatlantic Trade and Investment Partnership (TTIP) threaten to undercut U.S. dairy farmers by providing processors with​ ​easy access to cheap dairy products. Milk Protein Concentrates (MPCs) are milk proteins mechanically separated into a powdered form. MPCs have become a hugely popular and inexpensive option for industrial processors industrial processors to use in their dairy products. Minimal tariffs have allowed MPCs to flood U.S. markets already. 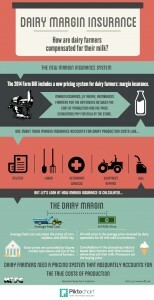 Further eliminating those barriers will only continue to undercut dairy farmers here at home. Over the past 35 years the dairy industry has become severely consolidated, with industrialized mega-dairies rapidly replacing smaller operations. The consolidation of fluid milk processors has left dairy farmers with fewer places to sell their milk. In some regions of the country there is only one processor to purchase dairy farmers’ milk, so if farmers want to sell their product at all they must accept what their area processor will pay. As shown earlier, the new margin insurance program bases its reimbursement in part on the average price processors are willing to pay. Market consolidation, both in the dairy processing and commodity crop industries (not to mention price manipulation through speculation on the futures market), leaves dairy farmers’ livelihoods in the hands of corporate interests. The National Family Farm Coalition Dairy Subcommittee is committed to exposing uncompetitive practices in the dairy industry and to building a more just system for all dairy farmers. This entry was posted in Blog and tagged Consolidation, Dairy, Fair Prices, Fat, Margin Insurance, Milk, MPC's, Pricing, TAFTA, TPP, Trade, TTIP. Bookmark the permalink.